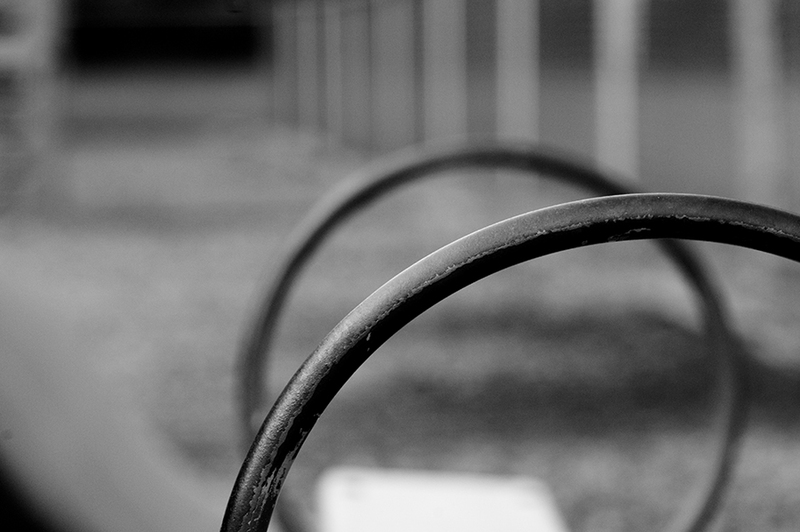 Tiny Corners / jamie olson photography // Playground lines. Saturday's post and subsequent comments have helped me to realize that a) I need to get out more and b) I need to retrain my eye to look for new things to photograph. So, this evening the kids and I took a nice walk on one of Oak Ridge's great greenway trails and ended up at the OR Preschool playground. My first instinct was to take kid and nature pictures, but I made myself look for other things. It was hard, and I didn't walk away with much. But it was good practice. I like this photo. The shapes and lines are great! Good start. Keep up the fine work. Intersting comment about training your eye. I think you have an excellent eye. Your three best pictures are Water-fun-Leo 2009-06-13, Monday 2009-06-08 and Water balloons 2009-06-25. Water-fun-Leo is powerful because of his eyes, of course, but also because of the powerful contrast between the water and his seemingly stucco skin. Monday is great because of the primary colors, of course, but also the textures. The out of focus red flowers in the background also emphasize the red of the hat. Water balloons, like Leo, is great because of the contrasting textures and the wonderful combination of all the different pastels.